Malaysian Prime Minister Mahathir Mohamad's diplomatic skills are unparalleled. After saying "no" to three "Belt and Road" projects, Mahathir is now speaking similarly about a gigantic property development led by one of the mainland's largest developers, Country Garden. Although he stopped short of saying the Forest City project - a development envisioned to house 700,000 people on reclaimed land near Singapore -- would be canceled, as he did with the East Coast Rail Link and two gas pipelines, the outcome of his remarks that foreigners will be banned from buying properties there could amount to the same thing. Caught by total surprise, Country Garden immediately plunged into crisis mode, blaming the media for taking the 93-year-old politician's remarks out of context. The Guangdong-based company's statement clearly failed to assure investors. Its shares were among the poorest performers on the Hong Kong bourse yesterday, shedding more than 3 percent even as the Hang Seng Index managed to stay on the positive side. Investors are taking the old man's words seriously, for he has only recently persuaded Beijing to accept the fate of the three "Belt and Road" projects - despite their strategic importance in President Xi Jinping's ambitious foreign policy. Country Garden's response was particularly frail, as the press event where Mahathir spoke about the ban on foreign buyers was recorded, and the video clip widely circulated on YouTube. The ban came straight from the horse's mouth. After ditching the projects on the grounds they are too expensive for Kuala Lumpur, Mahathir is taking aim at Country Garden's Forest City. Furthermore, he's reportedly doubling down on wanting the "great wall" built around the Malaysia-China Kuantan Industrial Park to be knocked down in the name of free movement for Malaysians. Throughout his political life, the veteran politician has been accustomed to saying "no" to the powers that be. He thumbed down the United States in the 1990s, during which he withstood Washington's opposition to his push for the idea of a regional free trade zone called East Asian Economic Group. But why is Mahathir taking a hard line on China now? Sri Lanka's handing over of its southern port Hambantota to China on a 99-year lease to settle a loan could be a factor causing Kuala Lumpur's rethink. 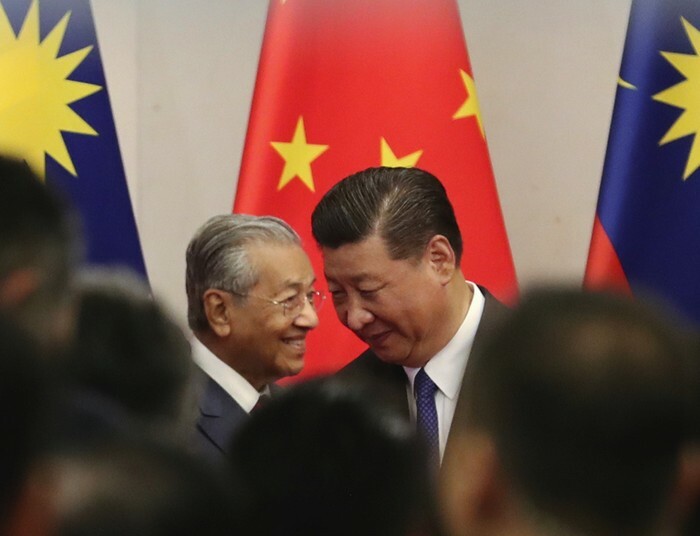 Mahathir is probably concerned about the rise of Beijing's influence in the multiracial country during his predecessor Najib Razack's regime, which conflicts with his long-time policy of striking a balance in a regional geopolitical rivalry currently dominated by America and China. One of the best known government leaders of the post-colonial era, Mahathir - like his late Singaporean counterpart Lee Kuan Yew - has been treading a fine line while resolving to keep Malaysia independent. Whenever the fine line is crossed, he stops it. He may also be clearing the way for his successor Anwar Ibrahim, also known as the country's prime minister-in-waiting, to start a new page. If it's hard for someone to say the word "no," it isn't true for Mahathir, who has just demonstrated how to say it in high diplomacy.